Nissan LEAF® electric cars are friendly to environmental and public health even though they contribute more to noise pollution than their original design intends, according to The Electric Car Guide: Nissan LEAF®. Noise pollution belongs on the list of environmental and public health contaminants along with air, land and water pollution since noise is aging, disruptive and stressful. Drivers, passengers and pedestrians who criticize conventional vehicles for moving parts, revved engines, road vibrations and wind drag call electric cars silent killers that move soundlessly. Pressure applied to and removed from the pedal drive the Nissan LEAF® into a silent acceleration from, or a soundless deceleration to, a standstill within seconds. Drivers expect silent starts and soundless stops from the Nissan LEAF® even though some legislation requires electric cars to make contributions, albeit minimalist, to noise pollution. Nissan's Oppama plant in Yokosuka, east central Honshu, produced first Nissan LEAFs. Second plant opened in Smyrna, Tennessee, in January 2013. In March 2013, Nissan opened plant in Sunderland as third Nissan LEAF production facility. Air dividing around the car’s front and reforming after the rear and the car’s rubber tires contacting the road surface furnish respective whoosh and rumble sounds. Fans operational whenever the power is on and speeds over 16 kilometers (10 miles) per hour generate sound that can be heard outside all electric cars. The Nissan LEAF® has a sound system that plays an engine note, audible to passersby and pedestrians, until road and wind noise become audible with acceleration. It is mandated by the Pedestrian Safety Enhancement Act of 2010, enacted Jan. 4, 2011, for new electric and hybrid cars sold in the United States. Author Michael Boxwell judges environmental and public health served by mandatory supplementary sound systems for all cars at speeds below 16 kilometers (10 miles) per hour. CleanTechnica writer Cynthia Shahan reveals her new 2015 Nissan LEAF as a silent drive in "10 Uses for a Silent Nissan." Experience as an electric car driver since 2006 and industry professional since 2003 and participation in noise-related projects since 2010 keep Michael Boxwell questioning mandatory alerts. Sound-tested drive-bys list the conventional Citroën C4 as “marginally quieter” than the Nissan LEAF® at 20-, 30- and 40-mile (32.19-, 48.28- and 64.37-kilometer) per hour speeds. They mean that alternative and conventional automakers have common agendas of quality simultaneously dependent and independent of legislation, according to The Electric Car Guide: 2015 Edition. A Nissan LEAF charges, not only at charging stations in busy urban settings, but also via home chargers as well as amid nature's stillness. Ever-increasing ranges and charging options encourage the Nissan LEAF's implicit "Go anywhere" lifestyle. Ecosystem applications of the term emissions prompt scientists to investigate environmental and public health impacts of gaseous, liquid and solid releases from personal and public transportation. Air, animals, land, people, plants, structures and water qualify as familiar impact points for heat, light and particle contamination and for the less familiar noise pollution. Vehicles release sound waves that indicate bumpy or smooth rides and cooperative or cranky parts in terms of maintenance and mechanics of personal and public transportation. The design of electric cars such as the Nissan LEAF® sees to exterior sounds remaining outside for road users and interior sounds staying inside for occupants. Acoustics, electronics and suspension turn Bluetooth-enabled talks, GPS-enabled tours, USB-enabled tunes and XM-enabled transmissions into private matters for drivers and passengers, not passersby and passing vehicles. Glow-in-the-Dark Painting Art with Nissan LEAF 100% Electric ~ On March 20, 2015, Guinness Book of World Records recognized painting of Nissan Leaf by Ian Cook as Largest Glow-in-the-Dark Painting. Boxwell, Michael. 20 April 2015. 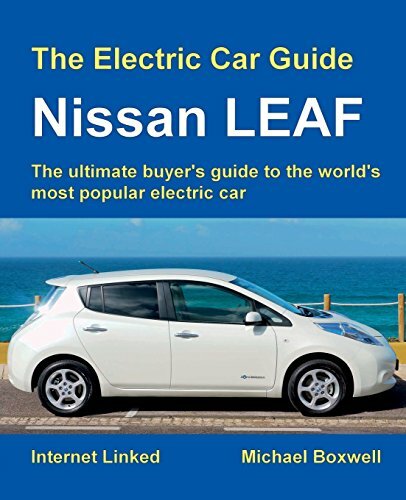 The Electric Car Guide: Nissan LEAF. The Ultimate Buyer’s Guide to the World’s Most Popular Electric Car. Coventry, England, UK: Greenstream Publishing. As the world's best-selling electric car, Nissan LEAF garners glowing reviews from its dedicated owners. Electric car expert and Nissan LEAF owner Michael Boxwell presents the world's best selling electric car. Nice to revisit this article. sandyspider, It's great that consumers, manufacturers and regulators were able to get together to keep Nissan LEAF quiet inside and just noisy enough outside for their presence to be detected by bikers, drivers and pedestrians caught up with less quiet models. Good to read about the Nissan LEAF and noise control. Thanks.